Risky pleasures? To what extent are the boundaries of contemporary understandings of (in)appropriate femininities shaped by young women’s negotiation of risk within the Night Time Economy? This snapshot will offer a summary of my current research project on how the boundaries of appropriate femininities might be policed and managed through women’s everyday practices within the Night Time Economy (NTE) in Newcastle-upon-Tyne, North East England. Through focus groups and semi-structured interviews with young women, my research will explore the embodied practices of alcohol consumption, presentation of the body and patterns of use of the NTE, facilitating a greater understanding of the extent to which notions of risk and respectability might continue (or otherwise) to regulate young women’s behaviour, and providing an insight into how particular classed and sexualised (in)appropriately feminine identities are conceptualised and performed. This snapshot outlines the broader area of my research into the literary ‘status’ and ‘value’ of contemporary chick lit, and then focuses on one area of my analysis – how chick lit is contributing to the literary debate of the ‘flâneuse’. The potential of a flâneuse – a female version of the traditionally male literary figure who observes and experiences the city – has been argued for nearly thirty years. Given Gemma Burgess’ use of the term in her 2011 chick lit novel A Girl Like You, could it be that it is now possible, in this postfeminist environment, for women to embody this role? This snapshot will offer a brief overview of the flâneur/flâneuse debate and use Burgess’ novel to consider its current relevance – and question whether, finally, a woman can be a flâneuse in contemporary culture. Through asking what queer migrations may have to do with straight subjects, this snapshot suggests putting scholarship concerned with the transnational social space, the gendering of migration research, and insights from queer migration studies into productive dialogue with one another. 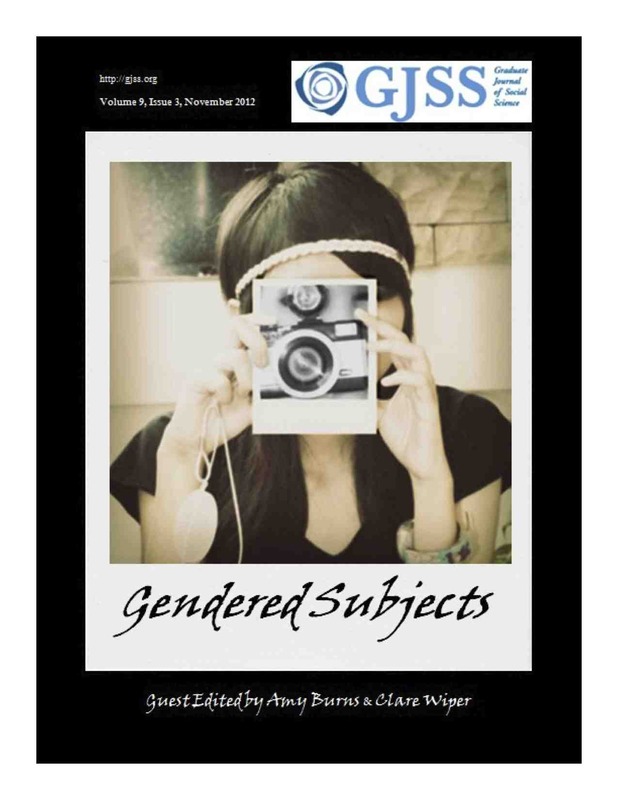 After a brief rationale for the wider project on subject formation in transnational social spaces, three examples illustrate how the gaps and overlaps between these literatures lead me to argue for the queering of social science methodologies to address heteronormative assumptions underlying much theorising and research on gender and transnational migration. Over the last decade there has been an increasing amount of societal and political attention given to violence against women in South Asian communities in Britain. This mounting interest has mostly been focused on specific forms of abuse – namely honour-based violence and forced marriage – which have been associated predominantly with South Asian, and in particular Muslim, cultures. However, evidence suggests that Western conceptualisations and responses to this violence have been largely informed by simplistic and essentialist notions of culture, leading to stereotypes and misapprehensions of South Asian communities as homogenous, patriarchal and inherently violent, and of South Asian women as passive victims waiting to be rescued by more civilised (Western) societies. To date there is currently little, if any, empirical research that examines how the British domestic violence movement is operating in this difficult terrain. This snapshot outlines an aspect of my PhD research which aims to examine how notions of culture and difference shape movement responses to violence against South Asian women. Sexuality continues to be an under-researched and overall taboo subject in the Arab world. In this snapshot I propose that media texts, particularly interactive online media texts, offer important platforms for sexuality research, enabling researchers to maneuver the restrictions placed on this kind of inquiry in other settings. Based on my doctoral project, I discuss the potential that critical and Foucauldian discourse analyses hold for this type of media-and-sexuality research and offer a few findings from my empirical study as examples of the methodological and theoretical promise of this type of analysis. My PhD research works within a socio-legal framework and engages with youth, sexuality and identity studies in seeking to discover how young adults within post-Section 28 school environments construct and understand their lesbian, gay and bisexual (LGB) identities. Analysing educational and social policy relating to sexualities and engaging with queer theory and notions of performativity, I attempt to understand how young people negotiate LGB identities through social practices and cultural discourses. This snapshot demonstrates why this work is neces- sary, outlining my intended research design and objectives and setting out my central research questions. This snapshot examines the visual and textual art of Tracey Emin and the response it generates. It asks why, in a climate of celebrity worship and reality television, her self-revelatory work still provokes such heated debate and demands for authenticity. Creative work which is apparently ‘confessional’ has long been the site of controversy, and this snapshot draws on feminist thinking about confessional poetry to discuss some of the difficulties in reading Emin’s work as directly auto-biographical and further, to interrogate why her subject matter seems to create such discomfort amongst her audience. This snapshot analyses the experiences of feminist academics in the UK. As my current research understands academia as a gendered social reality, this snapshot looks at how this gendered social reality affects and shapes feminist academics’ experiences. In this snapshot, I draw particular attention to the work done by Sara Ahmed (2010a, 2010b, 2010c, 2010d) who proposes that ‘feminist’ is understood as a difficult category, with the subject perceived to be stubborn and ‘unhappy’. In addition, empirical evidence from my current research is discussed in order to further illustrate my argument. This snapshot of my ESRC-funded research project summarises how the absence of men in the discussion of social policy, in effect, contributes to the gendering of men as men. It highlights, on the example of the Youth Justice System in England and Wales, how an incorporation of concepts of masculinity can inform practice when working with men and stresses the need for the inclusion of lived experiences of men in the conceptualisation of masculinity. This snapshot focuses on a doctoral study at the University of Manchester which is situated within a larger ESRC funded study, ‘The Hair and Care Project’, which seeks to explore the relationship between appearance and personal identity for people with dementia. The doctoral study accesses data from this wider study (http://www.esrc.ac.uk/my-esrc/grants/RES-061-25-0484/read). The snapshot presents male shaving as a case example of bodywork in dementia care and argues that male shaving could be a revealing lens through which to explore masculinity and embodiment in dementia care. This snapshot will analyse Alain Resnais’s 1963 film Muriel ou le temps d'un retour / Muriel or the Time of a Return, arguing that whilst deconstructing masculine patterns of spectatorship associated with hegemonic Hollywood cinema, the film nevertheless remains bound within normative notions of female identity, representing its central protagonist as a traumatised sign of national malaise as opposed to a speaking subject. Women, marriage and selfhood – Why change names? The aim of this snapshot is to consider name changing in Britain and what reasons women give for doing so. Name changing on marriage, in particular, is a highly gendered phenomenon as women are the ones usually expected to make the change; name changing remains the norm within Britain and there is a social expectation that women will conform to this norm. Here I will use the testimony of a small number of participants from my wider study on women, naming practices, and selfhood to look at four reasons they give for changing names: love, ‘oneness’, tradition, and societal expectations. Contributions from Dr Rachel Carroll, Professor Gabriele Griffin, Dr Tracey Jensen, Dr Ruth Lewis, Dr Julie Scanlon and Dr Angela Smith.